BTSKY 60 Slots Marker Case is perfect storage for your copic markers, Prismacolor marker, Touch Marker, Sharpie Markers and so on. Keep your marker pens organized and easy to access, handle on the top will help easy travel. 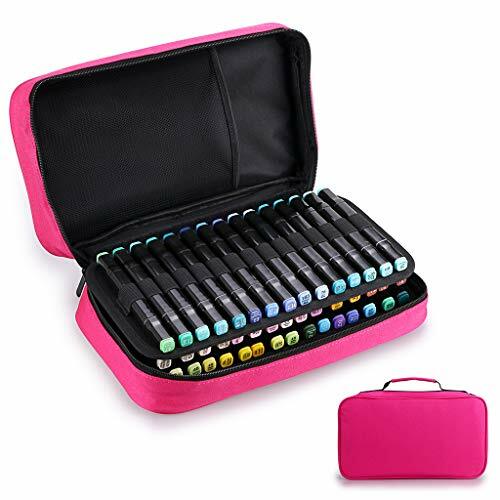 Carry your Prismacolor Markers and Copic Markers everywhere with this 60 slot Marker Carrying Case.This will be the perfect case so you can see all your markers instead of having them all in a big plastic case where you have to dig. Double sleeve design helps group colors easily, each sleeve can hold 15 pcs marker pens, the sleeve is detached by VELCRO, you can customize the case yourself. The marker holder is made of premium quality canvas and smooth zipper to last. Elastic loops secure the coloring markers and help you stay organized. When you're feeling inspired, simply unzip the case and unfold it into an easel. The perfect marker storage solution, it has elastic loops to secure your markers and a handy shoulder strap that makes it easy to tote. 60 INDIVIDUAL SLOTS - Multi-functional organizer keeps your Copic Markers and Prismacolor Markers at your hand. Easy to organize your precious collection by color and access what you need in seconds. PREMIUM QUALITY - Made from durable material and zipper, this marker case is well made to last for years- The case itself is lightweight and compact enough to transport. SMART STORAGE - Designed with removable a double-sided sleeves, each sleeve consists of 15 elastic loops (15 x 4 = 60 slots) with a zipper to ensure safe transit. Interal mesh pocket can store extra things. The exterior handle makes it easy to grab and go. FITS MARKERS AND LIPSTICKS: You can use this for your 60 pcs markers, besides, you can organize your lipsticks if you are a lipsticks/Lipsense distributor.A pockets on back sides will aslo store small items such as business cards, cellphone and pens. BEST AS A GIFT OR FOR SELF USE- With it smart storage capacity, this marker case is a best choice for organizing your precious collection, or as a gift for Birthday, Mother's Day, Graduation, Anniversary or Christmas!